Our names are Peter and Shruthi. 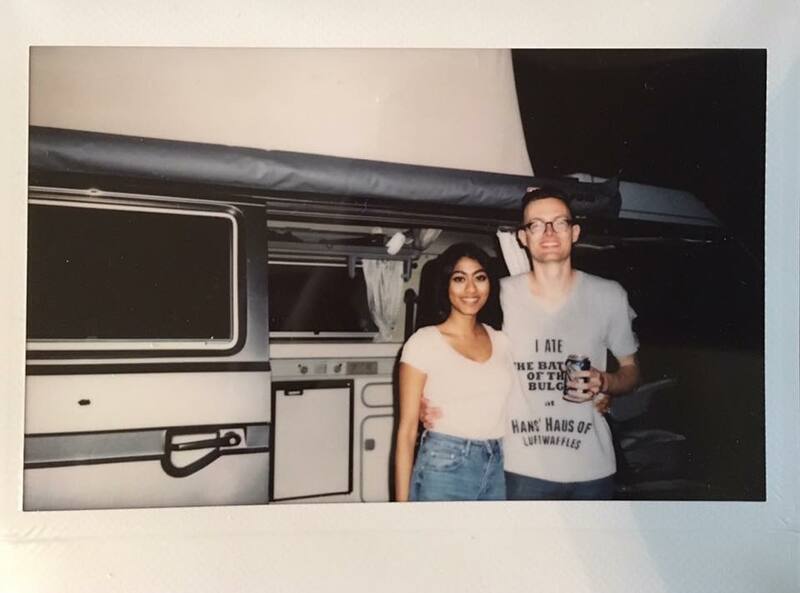 We're in love with travel, our Vanagon, and each other. We’ve been best friends for eleven years and the van has been a part of our lives for pretty much the same amount of time. After a mere four months of dating, we found ourselves beginning a long distance relationship when Shruthi moved to Illinois with her family. Peter’s interest in the Vanagon was born out of this complication (along with his childhood fascination with The Mystery Machine.) It was the perfect way for him to visit more often without the extra cost of a hotel room. Roughly six years passed and we were reunited in Nashville, Tennessee where we got engaged and then married. We quickly settled into this exciting time in our lives that we spent years dreaming about. We unintentionally started a tradition of putting away our savings for one big trip overseas together every year. Our adventures included a Fall honeymoon in Germany and Austria, backpacking/couchsurfing through the United Kingdom, various camping trips in the United States, and a two week road trip to Colorado for our first taste of van life. The travel bug hit us full force and we discovered that traveling together was one of our biggest dreams. Flying to Argentina to hang with our friends, Crepe Attack, as they made their way back from Patagonia sealed the deal for us. On the flight back home after an awesome time, we were convinced: we need to do this...and soon. How were we going to swing that? We had no idea, but knew we wanted to take the plunge. Not long after that trip, the heavens aligned and we both had the opportunity to take our jobs on the road and work remotely. Too good to be true? Apparently not, so we packed our bags, rented our house, and here we are on the open road. We're not hippies, existentialists, or homeless, just normal people looking for adventure. We don't have a set plan, but this trip is all about new experiences, facing fears, and learning what home really means.